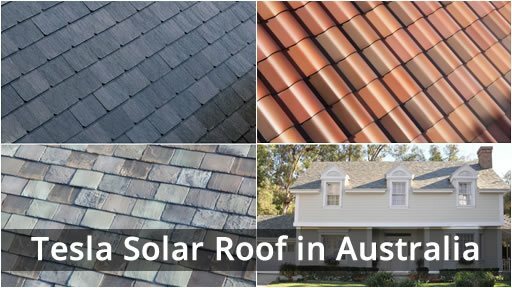 Exciting news from Tesla and Elon Musk last week as he announced that the Tesla Solar Roof Australia preorder is now available: they’ll be available in ‘almost any country’ and deployment will be this year in the US and 2018 for overseas countries. The tiles were announced last October and we reported on a tweet from Musk last month saying preorders were coming soon – and last week Tesla finally announced they have started production on two of their four initial designs. A smooth glass tile and a textured glass tile are available for preorder right now and will be released in Australia in 2018. The website states that the third and fourth designs, ‘tuscan’ and ‘slate’ will be available ‘early 2018’. This probably refers to the commencement of production, so it might be Q3 or Q4 2018 when these are shipped. Australians can place a fully refundable $1,310 (AUD) deposit via the Tesla website and, although we’ll have to wait until next year for the tiles to ship, excitement is growing and many local retailers are clamouring for install rights to the panels. 05.03.19 EDIT: Elon has taken the video off Instagram. As such, they have a novel idea towards warranty for the tiles – the lifetime of your home or ‘infinity’ – whichever comes first. They also have 30 year power and weatherization (Weatherization means that there will be no water leaks or other weather intrusions during the warranty period that result from installation) warranties in the US. As warranties are generally region specific we will have to wait to see how this changes for the Australian market. Tesla plans to ramp up the production of the solar roof with “significantly improved manufacturing capabilities during 2019”. They are facing myriad challenges this year so it’ll be fascinating to see how the company traverses these obstacles. Watch this space! The panels come in two flavours – ‘active’ – which means they work as solar panels, and ‘non’ active – just ‘normal’ roof tiles. As there are a number of factors such as cost, sunlight and energy requirements, you’ll be able to choose how many of each you want, keeping in mind that this is a full roof solution, not just adding solar panels to the top of an existing roof. According to Tesla, for a normal home, around 35% of the tiles will be solar. As reported, you can place a $1,310 AUD refundable deposit on the website today. With regards to the price: “The typical homeowner can expect to pay $US21.85 (~$A29.50 as per today’s exchange rate) per square foot for Solar Roof, and benefit from a beautiful new roof that also increases the value of their home,” a blog post on Tesla’s Solar Roof Website stated. This is assuming 35% coverage of active (solar) panels. Based on the pricing Tesla have released, if you have a 120 square metre roof (1291.67 square feet) – you can expect to pay around $38,340 AUD for a ‘normal’ Tesla roof install. These solar roofs are built to complement and integrate with the Tesla Powerwall 2 and we’ll be very interested to see what some of the cost savings are after they’ve been installed and the numbers crunched. Watch this space as we’ll update as soon as any more information is available! You can also sign up for updates from Tesla by clicking here. Enter your roof size below in square metres and get a price estimate. Sign up below to be added to our newsletter which will update you any time there’s new information or deals about solar roofs in Australia. This technology is improving rapidly so be sure to make an informed decision before you buy a solar roof!